This post is sponsored by Bob’s Red Mill. As always, all opinions are my own. Thank you for supporting the brands that keep Lively Table running! Can we just talk about something? The saying “easy as pie.” Why is that a saying? In my experience, pie is not, in fact, easy. It’s actually quite labor intensive to make a good pie. You have to make of the crust, roll out the crust, make the filling, and if you’re making a lattice top? Definitely not easy. Unless we’re talking about eating pie. In which case, yes, pie is easy. Because pie is tasty. Especially warm, cinnamon spiced apple pie in the cool, crisp fall, when apples are at their peak and perfect for baking into a delicious dessert. But taking the time make a delicate lattice apple pie is just not going to happen any time soon for me. Mama doesn’t have time for that. 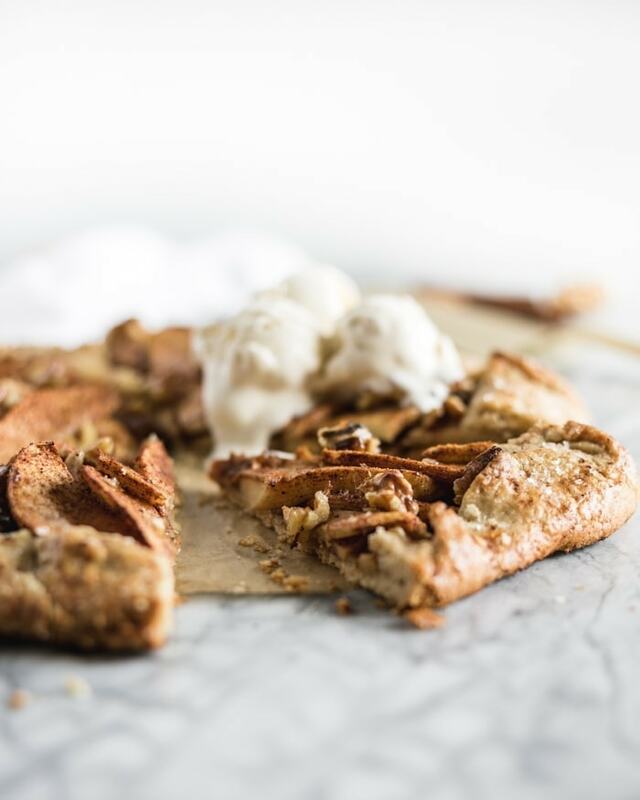 So I like to make a little easier version of apple pie instead, with an apple walnut galette. 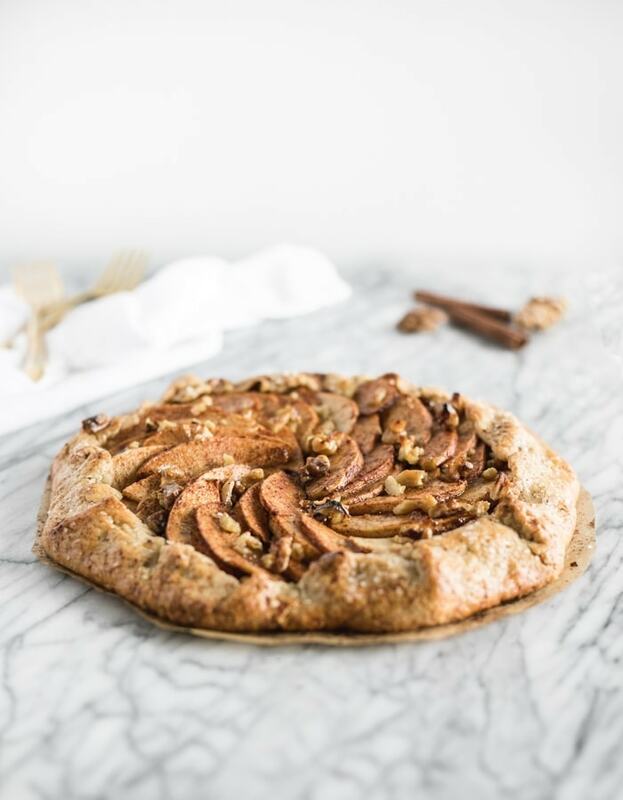 This whole grain apple walnut galette is just as pretty and delicious as apple pie, in a more rustic, organic kind of way, and it’s easier and less time consuming than making a real apple pie. Perfect for baking when you’re a new mama or on a busy fall schedule. I love using Bob’s Red Mill stone ground whole wheat pastry flour for my galette crust. It lends a light, flaky texture with a delightfully nutty taste (and the bonus of a little added nutrition). To me, it tastes way better than all purpose flour, and it’s much easier to use than traditional red wheat flour. 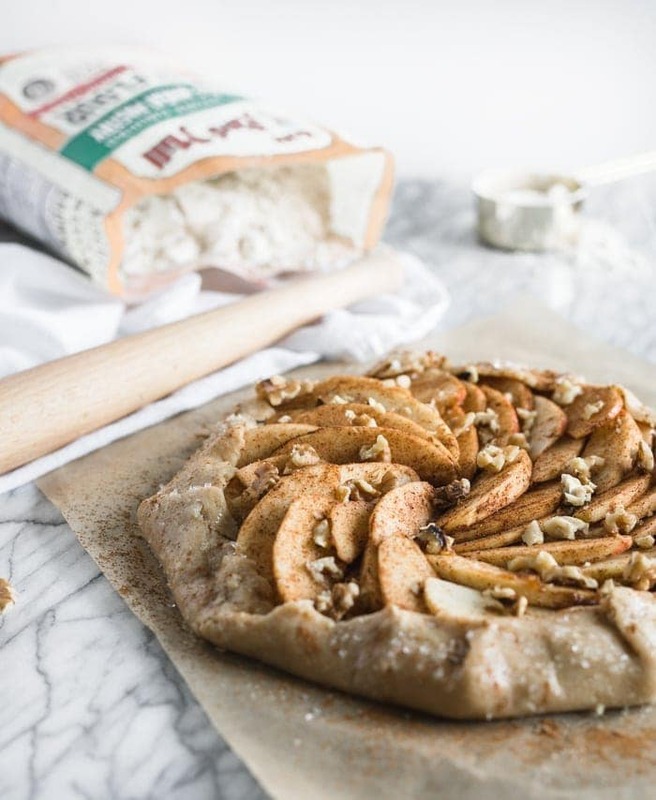 The flavorful, flaky whole wheat crust makes the perfect base for juicy, soft-baked, cinnamon spiced apples and toasty walnuts in this delicious apple walnut galette. 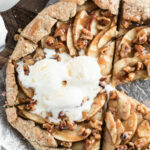 Use any apple you like for this galette, or a mix or them. I like Honeycrisp, Gala, and Fuji for baking with, but any variety will work. Peel the apples if you like, or leave the peels on for an even easier dessert (with more fiber too!). And if you’re dairy-free, you can use coconut oil in place of butter in the crust. 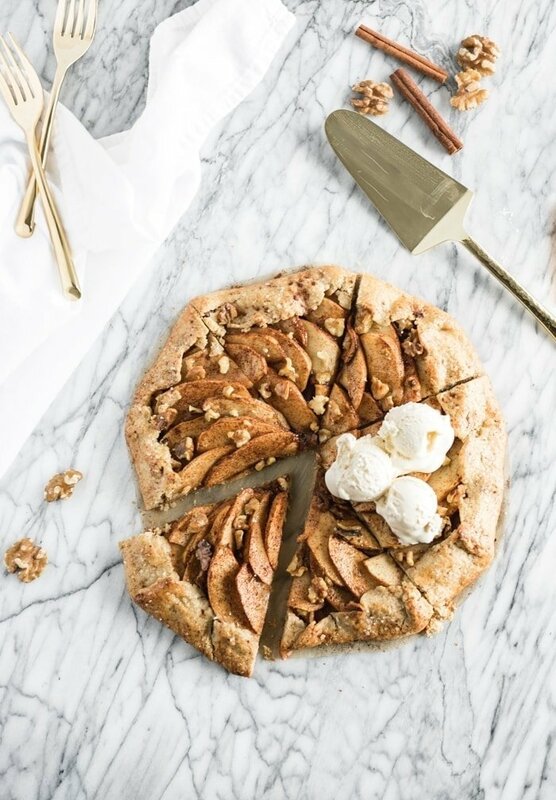 Serve this cozy apple walnut galette warm with a scoop of vanilla ice cream for the most delicious fall dessert. You won’t want to go back to traditional pie! Add whole wheat pastry flour, sugar, salt, and cubed butter to the bowl of a food processor. Process until butter is in pea-sized chunks. Add egg yolk, reserving egg white for later. Process, adding water 1 tbsp at a time, until dough forms a loose ball. Dump out onto a sheet of plastic wrap and roll into a ball. Chill dough 5-10 minutes. Meanwhile, prepare the filling. Thinly slice apples (about 1/4-inch thick) and place in a large bowl. Add sugar, cinnamon and nutmeg. Toss to coat. Roll dough out onto a piece of parchment into a thin, 1/8-inch circle. Place parchment and dough on a baking sheet or pizza stone. 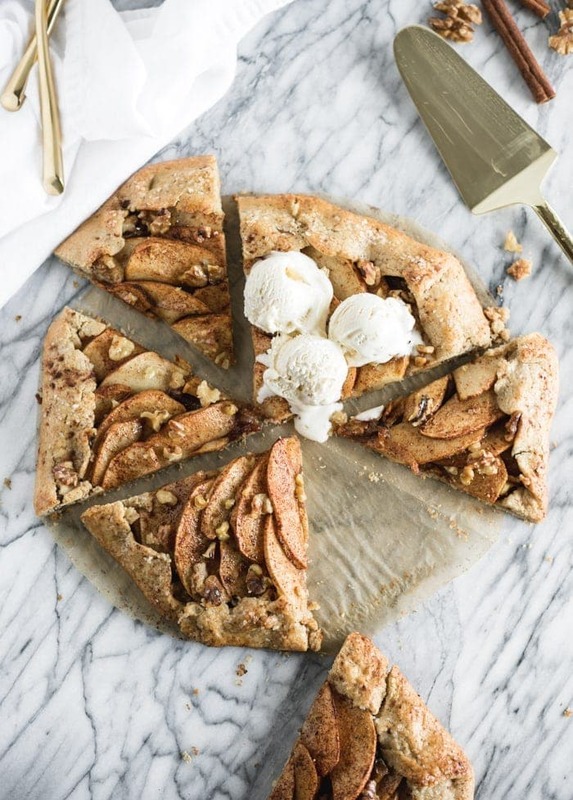 Arrange apple slices on top of the dough, leaving a two-inch border around them. Pour any juices from the apples on top. Sprinkle with chopped walnuts. Fold the bordering dough over the apples around the edges, working in a circle. Brush dough with reserved egg white. Sprinkle with cinnamon and sparkling sugar. Bake 15-20 min or until filling is bubbly and crust is golden. Remove from oven and cool 5-10 minutes before cutting. Serve with vanilla ice cream or whipped cream. This is gorgeous! And I always have that flour on hand! I love baking with it! I can’t believe I’m about to admit this out loud… I’ve never made a galette!! But they’re soooo pretty!!! This looks DELICIOUS!